With 26 miles of beaches, resort hotels, restaurants, shopping malls, a casino, luxury homes and golf courses, the Gold Coast serves as both Australia's vacation and retirement capitals. Founded by the late Steve Irwin, TV's "Crocodile Hunter," this 70-acre zoo is home to exotic wildlife, such as fresh and salt-water crocodiles, koalas, kangaroos and giant pythons. Lying inland from the famous Gold Coast, this volcanic plateau is a fertile landscape of national parklands, rainforests, and groves of macadamia nut, kiwi fruit and avocado. This is one of Brisbane's jewels and offers the opportunity for a day at the beach. Combining spectacular scenery, relaxing beaches and an exciting 4WD off road adventure, this is sure to be a great way to spend the day. 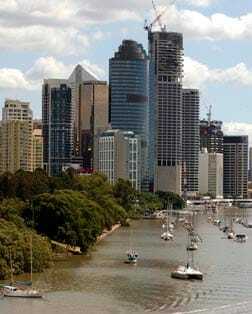 A popular cruise tour venue, this river runs through Brisbane and is the longest in southeast Queensland. It was named after Governor of New South Wales, Thomas Brisbane in 1823.